We have added 1ShoppingCart to our list of eCommerce solutions that Propeller provides fulfillment and integration for. Therefore, if you own a business that uses 1ShoppingCart we can help you grow, due to automating your fulfillment process. Integrating your eCommerce solution with Propeller, we can process your order and get them shipped efficiently and cost-effectively. Furthermore, the quicker an order can get to your customer, the more satisfied they will be! All of which can be done without hiring additional staff, facilities, and equipment. At Propeller, Inc. customers are able to securely connect with 1ShoppingCart and over 30 other eCommerce solutions. Therefore, helping you automate your fulfillment process. Because of the integration with Propeller, you will be able to automatically send orders, receive shipment confirmations and sync inventory with Propeller, Inc.
1ShoppingCart is a capable eCommerce shopping cart that is fairly easy to set up and get rolling with basic store operations, aided by their comprehensive offering of tutorial videos. 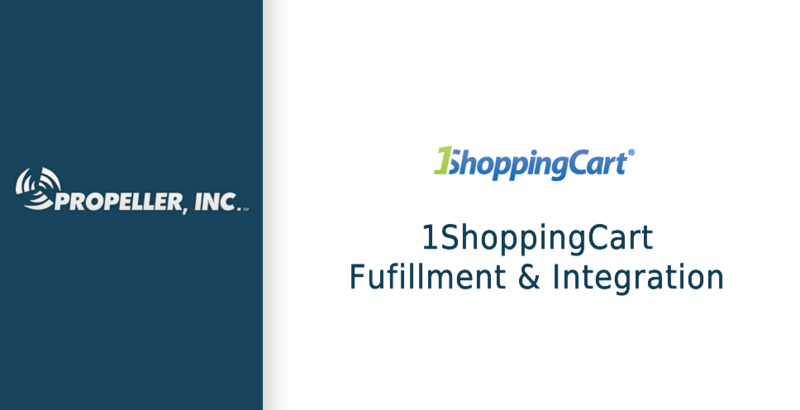 1ShoppingCart is set up to handle physical products, digital downloads, services, and membership subscriptions. It also has a strong affiliate program. It is a centralized and automated solution to manage all aspects of an eCommerce business – reducing operational costs and increasing efficiency. eCommerce is most successful when it is integrated directly with online marketing tools. And, when businesses grow tired of paying too much for multiple software products or want to alleviate the hassle of numerous, disconnected systems, they turn to it.